Man overboard! Hurry and dispatch the dinghy to save drowning pirate before the verocious crocodile takes him for lunch! The captain and his crew of two in the pirate playset is needed to navigate the pull- along pirate ship to the jail cell. Batteries Included…. This toy costs approximately £16.99 (for the latest and best prices make sure you check our retailer list for the Pirate Playset above). 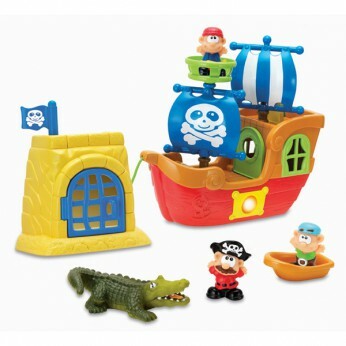 In our review of Pirate Playset we classed it as being suitable for ages 3 years, 4 years, 5 years but recommend you check the manufacturer specific advice before purchasing.